Despite cancelling our subscription, every once in a while my wife picks up the Sunday edition when she goes to the grocery store. As much I am an “online being,” I admit to still enjoying physically flipping through the paper or a magazine while eating breakfast or lunch. 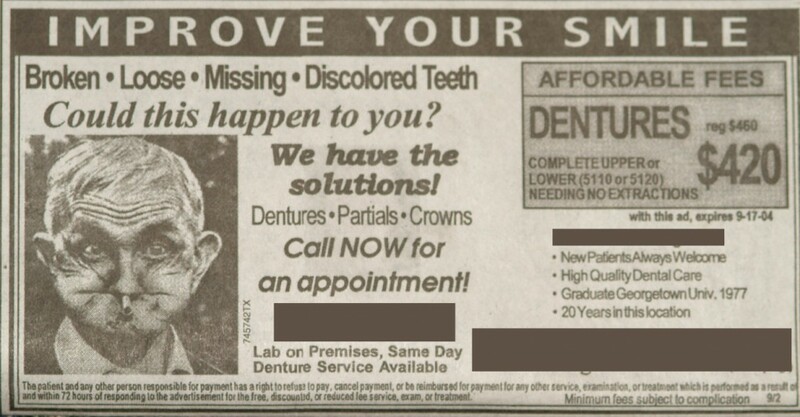 One of my “hobbies” is to peruse other dentists’ ads. I’m not sure why I look at them. They haven’t changed in the 2-1/2 decades I’ve been looking at them. A small part of me hopes that I’ll be inspired or get some great marketing ideas. Nope. They are mind-numbingly consistent. Most of them are the same dentists running the same ads for years on end. Occasionally I’d see a “new” one that would impress me, but not in a good way. Good ad? Bad ad? It’s been running for many years in the local paper. This was a REAL ad in my local paper! Paper, paper everywhere… and not an ad to be found. Today was one of the days my wife picked up the Sunday edition of the local paper. 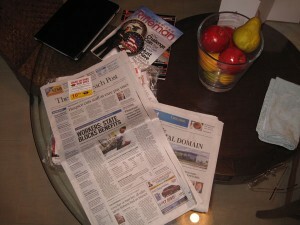 I sat down for my usual scanning of the thinner and now more narrow-format newspaper. It does fit on the kitchen table better. Something I saw… or didn’t see… struck me. There was not a single ad by a dentist in the entire paper. Not one! Wow. Maybe even dentists are starting to realize that print media is dying or already dead. I quit the Yellow Pages in 2007, and I haven’t missed it. I haven’t run a newspaper or magazine ad in at least that long. What about you? Yes? No? Do you track your results? Comment below! 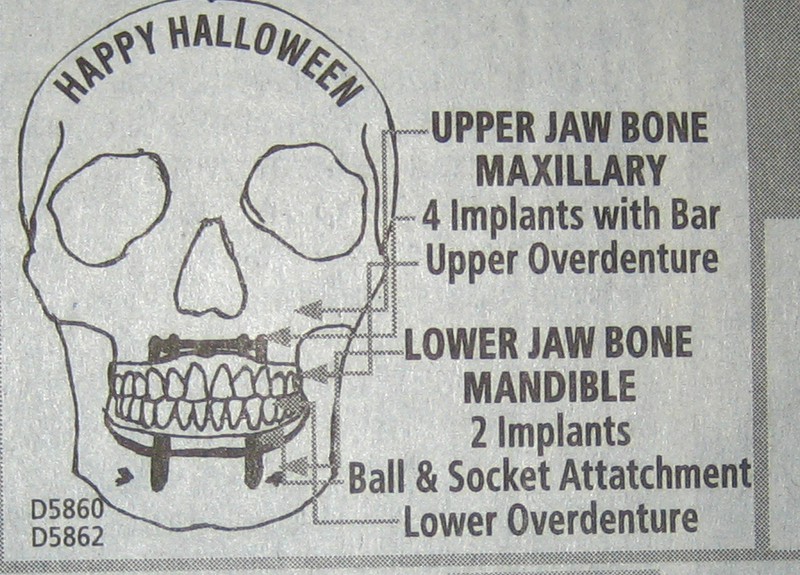 This entry was posted in Current Events, Editorial, Marketing and tagged newspaper, newspaper dental ads. Bookmark the permalink. 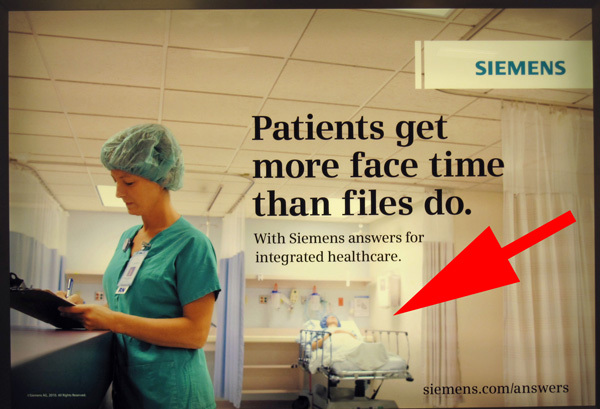 7 Responses to Is Traditional Marketing Dead? I agree with your observations. Newspapers are dying. They get thinner and thinner year by year with less content. Over the past 10 years we have used newspaper advertising a LOT. Over that time the returns have declined, which is true for all print media. 10 years ago we would run a big ad in the major local paper and the phone would ring for days. We still use the local major newspaper once a week or so and still get good results. Otherwise we would not continue to do it :-). Of course we have moved into internet marketing over the last 10 years as well. We got many good ideas from your book “What every dentist should know about website marketing” http://www.revupmymarketing.com/. There is a lot that goes into successful marketing. We have been at it for a long time, but we don’t know everything we need to know and of course we are always after a moving target. Look at what just happened with Google reviews. And then there is Yelp- nobody has any idea what the target is- don’t get me started on that! Thanks for chiming in. I was at my kids’ orthodontist office last Friday. I picked up the current copy of Newsweek in his reception area. Pathetic! It’s very thin. I remember when Newsweek was much more robust. Are you still in the Yellow Pages? I’m an Aussie dentist who owns a number of practices in Brisbane across a wide socioeconomic range of areas. Everything you have written is completely SPOT ON even here in Australia although we are a few years behind trends. Before i continue, I would like to add that we have a question in our medical hx forms that patients have to fill in which simply asks how you heard about us? If they don’t feel this question is relevant my front desk asks them verbally and all answers are entered into our dental software package. It allows me to easily see where our marketting dollars are best used. When i bought my first practice in 2008 – i advertised in many different mediums – print, online, billboards etc etc. Back in 2008, other than word of mouth referrals, our main method of ppl finding us was yellow pages. Naturally i was spending quite a bit on yellow pages. As of late last year, I no longer have paid adds in yellow pages (I still have my free listing), as yellow pages was doing nothing for us in terms of new patients. Fast forward to now (2012) and again word of mouth dominates but our main sources are google! Sporidically (once a year or 18 months) We do a letterbox drop and this also helps quite a bit for an initial burst. But def my adwords spend is quite a bit and the SEO on my sites ensures were are within the first three results most times. Our straightforward ROI is about 15 times what i spend on google advertising. But this doesn’t take into account how many pts these “google patients” refer or how many we might somehow not enter as being from google (prob around 5%). I have gained quite a bit of knowledge through reading your blogs etc in terms of search rankings but unfortunately our registration body does not allow any form of patient testimonials at all. Thank you very much for your blog which I enjoy reading! Thanks for checking in and posting your comment! Good stuff. It’s always interesting to hear perspectives from colleagues in other countries. You make a good point about tracking your referral sources. It’s vitally important, of course, to know what works and what doesn’t work. Otherwise you’re a ship without a rudder. I hope you’ll stay in touch here and post more comments! Thanks! Stumbled upon your blog today.let me congratulate you on this extraordinary effort of yours. Every single thing you have written under the MARKETING head is true. I practice in India and newspaper ads here also have started to generate lesser number of enquiries compared to previous years. Though not very sure about Facebook marketing as I have never received the kind of return you have from your Facebook ads. Learned a lot from your blog.i will be a consistent visitor here from now on . Thanks for visiting and your comments, Prateek! We are now living in the digital era where every information is accessible with a touch of a button. I somehow agree with your conclusion that newspaper marketing is decreasing exponentially. But I believe that the modern way of marketing is more budget friendly and reaches your target directly. An expert in dental digital marketer will be a great help to set up ad campaigns that convert your audience to leads.